Stop making resolutions that never last and start setting Christ-centered goals instead. It doesn't matter if it's July or January, today is the day you can begin goals that will draw you closer to Jesus and set your life and your family in line with God's plans for you. The Thriving Life Goal Setting Planner will help you do just that. By setting goals that are in line with God's plan for your life, you will experience a sense of purpose and drive like never before. In A Thriving Life Goal Setting Guide you'll find out why prayer and position in God's plan are important parts of goal setting as well as how to set goals that are trackable and achievable. 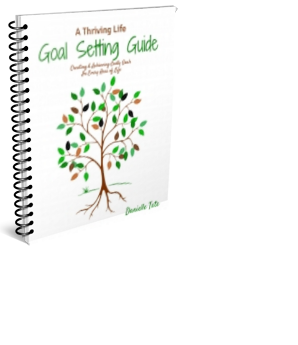 Why Buy A Goal Setting Guide? Anyone can scratch down goals on paper and stick them on the refrigerator in January and hope to accomplish them by December but how often do that really happen? According to Statistic Brain, only 46% of Americans who make New Year's resolutions keep them past June. This is why using a planner to set goals instead of resolutions is a superior way to achieving lasting life changes. Grab your copy of this digital goal planning guide today for $9.97 and begin the journey of living a thriving life! Remember, your new year starts when you're ready.